Adopted from siy for updates. Review by falconchris on 3/26/2012. Multi player only, AI's not intelligent enough to avoid the negative bonus traps. Review by BluesBrother57 on 3/25/2012. fix the bonuses. purple castle has a bonus the same as every other castle. (worth 10, next to the 20 bonus on the front) it has 10 territorys while the rest of the castles have it for 6 territorys. there are other problems players in my game reported. Fixed! Thanks for your feedback. Review by [REGL] Pooh on 4/26/2012. Okay Map. The Walls/Paths Tricky for the first time. Some Inconsistant-non-symmetrical bonuses, plus center is too overweighted to be in the distribution. Perhaps a race to it would be better. -Fix Non-Symmetrical Bonuses in Purple and Green. 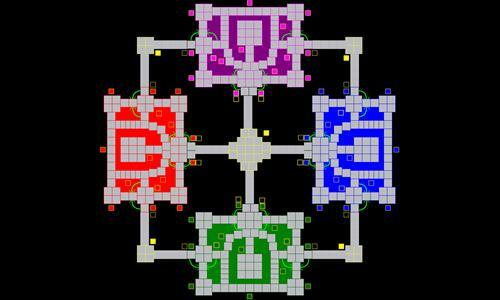 -Add Extra territories to the 4 player FFA so the castle can be filled out quicker rather than having everyone start in the center. Its almost 30 turns before you can fill out castle without multiple starting points. Maybe add the 4 corners for a total of 5. Took map over from siy to make corrections on 2/7/2013. Review by Berserk on 3/4/2013. Too many long pathways made out of rows of territories. That really drags the game out, makes it way too slow and boring. Review by jlphelan on 5/16/2012. Review by Andalorium on 3/25/2012. Review by XenonXperia on 3/26/2012. VS npc's this is way too easy. NPC's dont avoid the negative armies and they get 0 armies quickly. Review by  b3rz3rk3r on 5/10/2012. found 2 errors during play. -bonus 14, has 4 additional territories. -you can't move between the 2 upper center fields. But it is a fun and interesting map besides the few minor errors. Fixed, Thanks for the Feedback! Good stuff. The negative provide an additional layer of complexity to gameplay. My only complaint is that the little arrows intended to show how territories connect underneath the walls make it look like the territories connect TO the walls. A word of clarification to players - envision the perimeter of each castle as a second-story wall with entrances and exits going through gates beneath the walls. Review by [LOD] mole on 3/26/2012. Review by Novirtue on 6/7/2013. Takes really way too long to go up the castles to get rid of the negatives, AI has a hard time with this map. Review by Destroyer on 4/8/2012. I really enjoyed this map. Review by kzador on 3/8/2013. La inteligencia artificial se trabo, ojala solucionen ese problema. Review by Nemoricus on 3/27/2012. Not a bad idea, but the default distribution makes this map terribly slow to play as players have to slowly work their way out from the starting positions. Fixed, by adding several new distribution modes. Review by Maggot Brain on 10/31/2013. This map has some cool ideas but the moat system doesn't make a lot of sense. Needs to be reconfigured before playable. Review by Kat' on 7/2/2012. Very poor design. In practice mode the IA will lock itself capturing the two -10 bonuses too early. The walls can only be captured after like 30 turns. The map is so slow to play that it's enarly unbearable, and there are practically no tactical possibilities. Review by CapTainB4ckFir3 on 4/29/2012. Review by Sizard on 10/27/2015. Review by Silas Hagland on 2/17/2016. Review by Jeffotato on 5/15/2016. Forces you to use very precise strategies, using negative territories. Review by DanWL on 5/19/2016. Complicated commections; make sure that you read what's connected to which territory. Review by Ramteid on 6/29/2017. Review by Life is Good on 7/11/2017. confusing, makes no sense just starting out. The castle entrances with the arrows make no sense. Review by aprasha on 1/21/2018. Review by Kwickkid1 on 9/7/2018. Was a confusing map for the first couple times. But after that its nice. Just hope you get someone understanding when playing against if your not sure. Just ask.. took a couple time for me to get used to it..
Review by Hemija on 3/27/2012. Review by Darth Bobicus on 4/3/2012. would be better if the wall and tower portions led onto the lanes to other castles rather than a jump directly from the keep. Review by Samson on 6/16/2014. Review by Littlejoe on 5/5/2014. Review by andrew on 1/11/2014. Review by MechArmy on 4/2/2012. Review by RijS on 11/10/2013. A very simple map with lots of space to create a stalemate. Even after an opponent attacks. Review by PSV Supporter on 6/29/2014. Terrible map. Several territories do not connect, although visually they do. Review by indiman112 on 7/29/2014. Review by DOA-DFA on 9/17/2014. Review by Shadow (HUN) on 11/1/2014. Review by Mark The Destroyer on 11/27/2014. Use your choke points and be wary of the negative bonuses. Review by ErrantDebris on 5/21/2016. While an interesting concept, it lends to drawn out games with little happening each turn. Review by schwarz on 5/21/2016. Review by John on 5/25/2016. Review by Endril on 6/3/2016. Pretty good map, interesting to play, the only negative is that there is too expanding to do until you actually met another player in battle. May be better to use it on real time games. Review by GryffindorLab on 7/17/2017. Review by LiddelHart on 3/4/2018. Review by jk3000 on 3/25/2018. Review by 4Soccer on 6/29/2014. Faulty map. Territories not connecting where they should. Review by Yksisarvinen on 3/24/2016. Review by MainstreaM on 4/26/2012. To bad the AI can't handle the -10 at the centre and stalls.